1 Politically, the suburbs are evenly divided overall, but some have a clear Democratic or Republican tilt. The even divide in the suburbs and small metro areas differs from rural counties, which tend to have a higher concentration of Republicans and Republican-leaning independents, and urban counties, where a majority of registered voters identify as Democrats or lean toward the Democratic Party. There is some variation in suburban communities by region of the country, which are, for the most part, consistent with overall regional variations. For example, data from 2016 and 2017 show that the suburbs of New England (that is, Connecticut, Maine, Massachusetts, New Hampshire, Rhode Island and Vermont) lean Democratic. A majority (57%) of registered voters in suburban New England identify as or lean Democratic, compared with 35% who identify as Republicans or Republican leaners. Suburban registered voters in parts of the southern United States, on the other hand, are more likely to be Republicans. In the suburbs of the census area known as the East South Central division (Alabama, Kentucky, Mississippi and Tennessee), 56% identify as Republicans, compared with 37% who are Democrats. Still, in a majority of regions across the U.S., suburban voters are about evenly split in their partisanship. 2 Poverty has increased more sharply in the suburbs than in urban or rural counties. 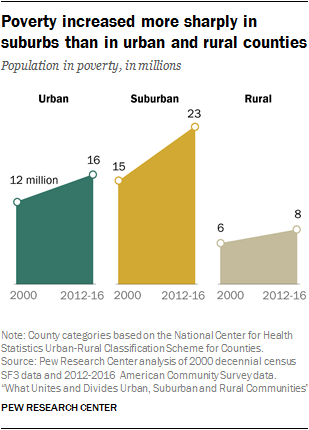 Since 2000, suburban and small metro counties overall have seen a 51% increase in poverty, compared with a 31% increase in urban counties and a 23% rise in rural counties. Overall, the poverty rate is somewhat higher in rural (18%) and urban (17%) areas than in suburban (14%) counties. Suburban residents are less likely to report that poverty is a major problem in their local community (21%) than those living in urban (41%) or rural areas (32%). 3 Although the population is aging across all community types, suburbs are seeing the most rapid growth in older adults. The aging of the Baby Boom generation is having varying impacts on different county types. Rural areas have a higher share of adults ages 65 and older than urban or suburban counties, but suburban counties are aging the most rapidly. The 65-and-older population has grown 39% in the suburbs since 2000, compared with 26% in urban and 22% in rural counties. 4 Suburban counties have the highest drug overdose fatality rate of any community type. These counties experienced 36,424 fatal drug overdoses in 2016, up 22% from the year before, according to the Centers for Disease Control and Prevention. This translates to an age-adjusted overdose rate of 21.1 deaths for every 100,000 people in suburban counties. By comparison, the overdose death rate was 18.7 per 100,000 people in rural counties and 18.5 per 100,000 in urban counties. Around a third of suburban residents (35%) say drug addiction is major problem in their local community – lower than the 46% of those in rural areas and 50% of city dwellers who say the same, according to Pew Research Center’s survey earlier this year. An additional 52% of suburban residents say drug addiction is a minor problem where they live. 5 Suburban counties are the only ones that have gained population from other community types, as well as from abroad. Suburban and small metro counties have grown since 2000 because of people moving from urban and rural areas, as well as immigration from abroad. While all community types gained at least some population from international migration, suburban counties stand out in terms of domestic migration. A net of 6.4 million people have moved from urban and rural areas into the suburbs since 2000 (meaning that 6.4 million more people moved into suburban areas from an urban or rural area than moved out of suburban areas to different types of communities), while cities lost a net of 5.4 million people and rural counties lost 1.0 million people to other community types. 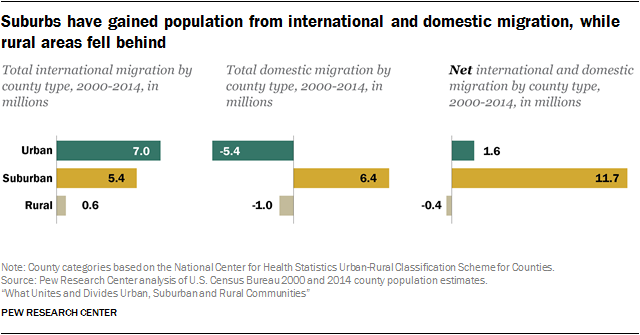 Combined with international migration, urban counties gained a net total of only 1.6 million people due to migration and rural counties lost about 400,000, compared with suburban counties’ gain of 11.7 million people. Demographically, the suburbs are racially and ethnically more diverse than rural communities but less diverse than urban areas. Overall, suburban counties and small metro areas are 68% white, 14% Hispanic and 11% black. As the nation overall becomes more racially and ethnically diverse, these changes have been more pronounced in suburban and urban counties compared with rural ones. The white share of the population fell 8 percentage points since 2000 in the suburbs, 7 points in the urban core and only 3 points in rural counties.